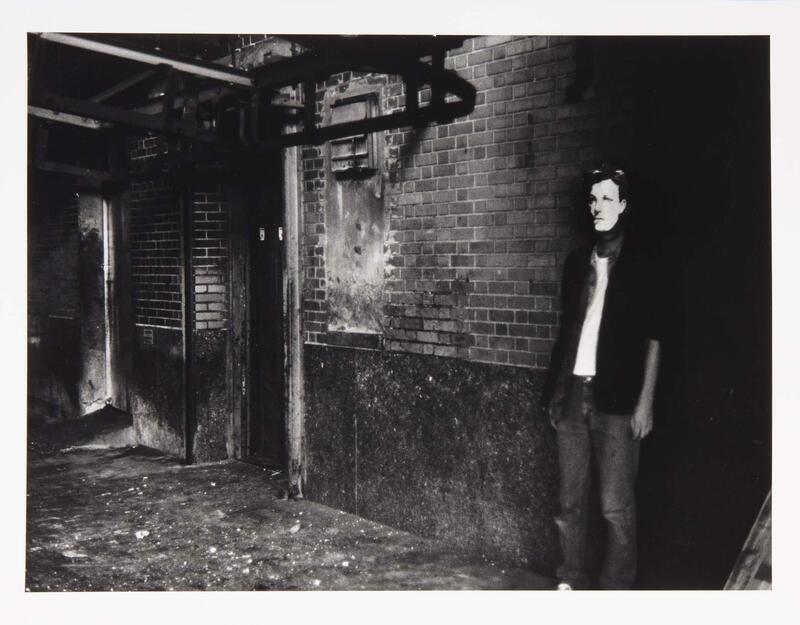 Arthur Rimbaud in New York, one of David Wojnarowicz’s few incursions into photography, is the articulation of a testimony to urban, social and political change in New York. Wojnarowicz, using the figure of the accursed poet as the only way for an artist to intervene in reality, chronicles his own life and his emotional relationship with New York City in the late 1970s. The artist portrays himself wearing a mask of the French poet Arthur Rimbaud, thereby taking on his identity and highlighting the parallels in their lives: the violence suffered in their youths, the feeling of being denied freedom, the desire to live far away from the bourgeois environment and the fact of their homosexuality. Wojnarowicz is juxtaposing the historical time of the symbolist poet with the artist’s present. The series, taken in places that the artist used to frequent with photographer Peter Hujar, represents the emergence of identity politics and queer visibility in contemporary art, and the debates surrounding the public sphere as a space for individual non-conformity that were to shape the 1980s. The series also represents a contemplation of the end of the experimental artists’ collectives on the Lower East Side, as gentrification and urban speculation transformed the neighbourhood, and AIDS had begun to decimate the gay community, also causing the early death of the artist in 1992. David Wojnarowicz : tongues of flame : [exhibition] / edited by Barry Blinderman ; [organizated by the] University Galleries, Illinois State University, Normal, Illinois. Wojnarowicz, David ( 1954-1992)New York : Distributed Art Publishers, D.A.P., 1990. Close to the knives : a memoir of disintegration / David Wojnarowicz. Wojnarowicz, David ( 1954-1992)New York : Vintage Books, 1991. Fever : the art of David Wojnarowicz / Dan Cameron... [et al.] ; edited by Amy Scholder. Wojnarowicz, David ( 1954-1992)New York : Rizzoli, 1998. David Wojnarowicz readings, 1992 [Video] : including funeral procession / by James Wentzy. Corporal politics : [artists] Louise Bourgeois ... [et al.] / essays by Donald Hall, Thomas Laqueur, and Helaine Posner. Hall, Donald ( 1928-)Cambridge : MIT List Visual Arts Center ; Boston : Beacon Press, 1992.